The Crawford County Health Department Environmental Health Division inspects food service establishments to ensure they comply with all aspects of food protection, sanitation, preparation, and service as outlined in the Illinois Department of Public Health 2008 Illinois Food Service Sanitation Code. 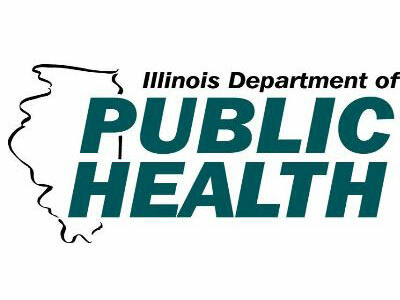 Any business or food establishment that sell food items to the general public within Crawford County, must be licensed and routinely inspected by the CCHD. Any establishment or business that prepares or sells food items for sale without being licensed or inspected, or does so from a kitchen within a private residence, is in direct violation of the Code and should cease all food service operations and contact the CCHD. Non-profit fundraising bake sales, potluck dinners, etc., are considered 'Eat at Your Own Risk' and do not fall under the regulation of the local health department. Such events carry the potential for creating a food-borne illness outbreak due to potentially hazardous foods being prepared for consumption in non-regulated kitchens. Persons whom participate in non-regulated events assume all potential risks and liabilities that could result from a food-born outbreak. For such non-regulated events, please print for display the 'Eat At Your Own Risk' placard from the link on the right side bar. Farmers' markets must follow the rules as outlined in the farmers' market links on the side bar to the right. Proper food sanitation is important in helping to prevent food-borne illnesses in a food establishment as well as in the home. Using proper procedures when cooking, cleaning, storing, and handling food will help to ensure that the food you eat or serve is safe. Proper washing and sanitizing of equipment, utensils, and surfaces will also help to prevent cross-contamination between foods. In food service establishments, non-scented household bleach is commonly used as a sanitizing agent. When mixed with water to the appropriate concentration, this provides a safe and effective sanitizing solution. When storing cold foods, keeping these foods below 41 degrees Fahrenheit will help to prevent harmful bacteria from growing. When cooking foods, cooking the food to the recommended temperature will also help to ensure its safety. When holding hot foods to be served, keeping the foods above 135 degrees Fahrenheit will help to prevent harmful bacterial growth. Proper cooling of hot foods is another way to help prevent bacterial growth in foods. Hot foods should be cooled from 135 degrees to 70 degrees within 2 hours, and from 70 degrees to 41 degrees or below within 4 more hours for a total cooling time of no more than 6 hours. Examples of methods to cool foods: divide large amounts of food into smaller portions before cooling, cut solid foods into smaller pieces before cooling, place foods in shallow pans and leave uncovered in refrigerator until cooled, or placing containers in an ice-water bath and stirring frequently until cooled. Following proper personal hygiene procedures also helps to prevent contamination of food, equipment, utensils, and surfaces. Proper hand-washing etiquette such as washing your hands after: using the restroom, eating, handling raw foods, smoking, handling unclean equipment, taking out the trash, or touching unclean surfaces helps to prevent cross-contamination and spreading germs. Other personal hygiene rules to follow when preparing and cooking food are to keep fingernails trimmed, keep hair restrained, keep cuts and open wounds bandaged, remove jewelry, and refrain from tobacco use. A new study finds that ninety percent of Americans say they've prematurely discarded food because they misinterpreted the "sell by," "use by," and "best before" dates on products. The following link explains these phrases and how they can be confusing. 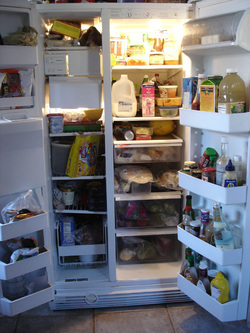 It also explains the best ways to stock your refrigerator in order to maximize the storage space and the temperature differences to save the average consumer money.